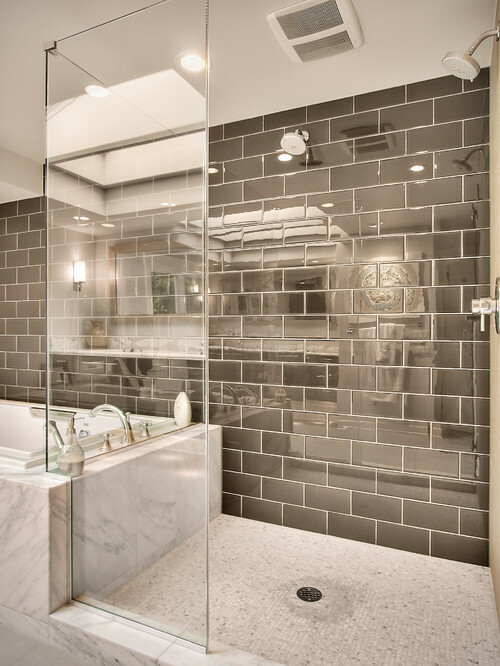 Glass tiles can be a beautiful feature in any room. They provide a sleek and polished detail that works in almost any design style. However, there are a few glass tile pros and cons that you should be aware of before you decide on this modern feature. 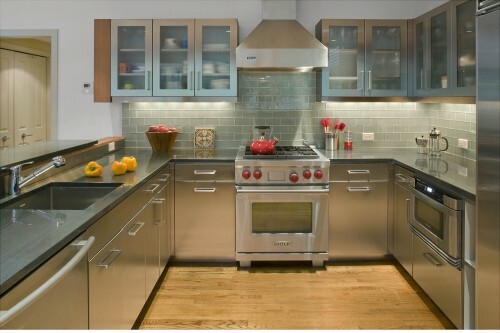 Glass Tile Pros and Cons – Beauty or Beast? Don’t get me wrong, I looooove glass tiles. (In fact, I designed my guest bathroom with them, but more on that later). What I don’t love is the ease with which glass surfaces smudge and show things that would not be noticeable on a matte or opaque surface. And therein lies the problem with glass tiles. Just like any glass surface, they will show every streak, smear, smudge and water spot that isn’t painstakingly buffed clean. And if you have children, the finger smudges that they leave behind will astound you, if you install glass tiles in an area that they will use. Take this bathroom, for example. The glass is beautiful, but I promise you that every water droplet that dries on these tiles will detract from its beauty. In addition, finger prints will produce smudges and smears that will frustrate you to no end. Eventually, you may come to loath your glass tiles. Just imagine having to clean grease off of your windows and you will know what you will be in for with glass tiles in a kitchen. Because with glass, not only will it have to be clean, it will have to be streak free. Otherwise, you will see it when the light reflects off the surface. 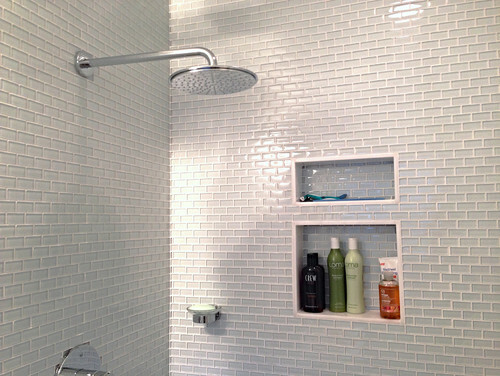 However, if you want to use glass tiles anyway, you could always use smaller tiles. 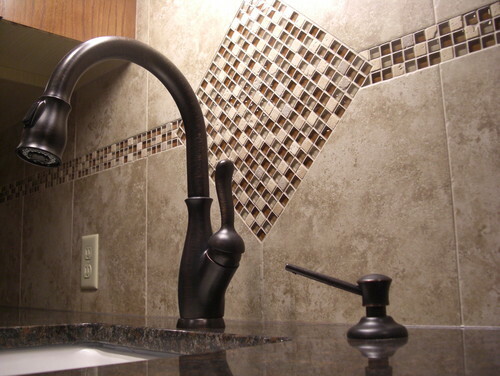 Because the reflective surface is cut down by all the grout lines, normal smudges and water spots will not be as obvious. 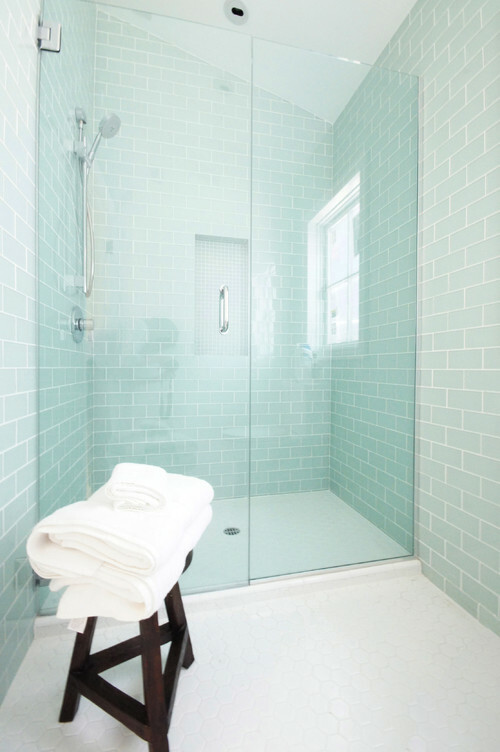 You could also install the glass tiles as a feature wall that is less likely to be splashed or touched. 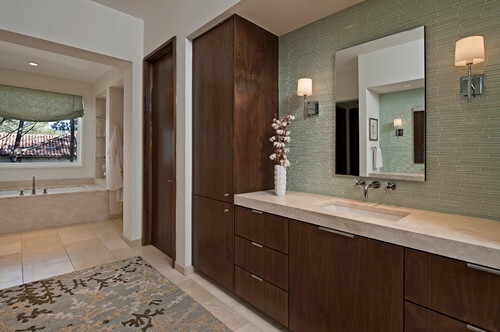 Behind a master bathroom sink is a good option. It creates the high end detail without all the extra effort required to keep the glass spotless. 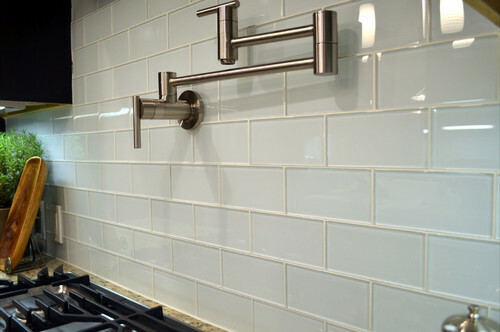 Another good option is to just use glass as accenting to break up a solid tile. This way you have much less area to maintain, but you still get a bit of that glass look. However, for those that want the all over install but don’t want to worry about wiping down spots and smudges constantly, perhaps the best idea is to use them in a dry room or one that will not get much use. Because I loved the glass so much, I chose my guest bathroom as the area for my install. So, the shower only gets used a few times a year. This makes it less of a chore to keep it looking pristine. 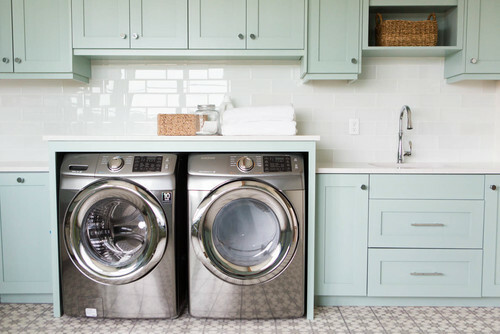 Another good room is a laundry room. Kids seldom go there, so fingerprints should not be a problem. Also, there is no shower to create spots. Cement Tile – 2017’s Tile Trend! Arabesque Tile – 2016 Tile of the Year! Brass Hardware Makes a Comeback!